[172 Pages Report] The synthetic monitoring market size is estimated to grow from USD 919.2 Million in 2016 to USD 2,109.7 Million by 2021, at a CAGR of 18.1% from 2016 to 2021. The main objective of this report is to define, describe, and forecast the global synthetic monitoring market on the basis of components which includes monitoring types and associated services which include professional services such as business consulting services, implementation services, and training and support services. It is also segmented on the basis of deployment types, organization sizes, verticals, and regions. The report provides detailed information regarding the major factors influencing the growth of the market (drivers, restraints, opportunities, and industry-specific challenges). The report attempts to forecast the market size with respect to five main regions, namely, North America, Europe, Asia-Pacific (APAC), Middle East and Africa (MEA), and Latin America. The report strategically profiles key players and comprehensively analyzes their core competencies. This report also tracks and analyzes competitive developments such as joint ventures, Mergers and Acquisitions (M&A), new product developments, and Research & Development (R&D) activities in the market. The synthetic monitoring ecosystem comprises vendors providing synthetic monitoring solutions and services to their commercial clients. Companies such as CA Technologies Inc. (U.S.), BMC Software Inc. (U.S.), IBM Corporation (U.S.), Dell Technologies, Inc. (U.S.), Dynatrace (U.S.), Microsoft Corporation (U.S.), Hewlett-Packard Enterprise (U.S.), and many others have adopted new product launches as their key strategy to enhance their market reach. This strategy accounted for the largest share of the total strategies adopted by the market players. 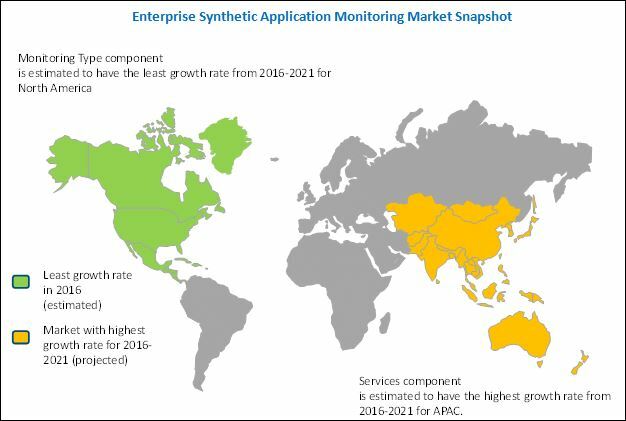 MarketsandMarkets forecasts the synthetic monitoring market size to grow from USD 919.2 Million in 2016 to USD 2,109.7 Million by 2021, at a Compound Annual Growth Rate (CAGR) of 18.1%. Synthetic monitoring process is instrumental in methodically and proactively monitor the network and application performance using external agents, which intimates the actual end users and web traffic, using which simulation test is carried out to automate transactions against web applications, user behavior, and monitor and manage performance accordingly. Synthetic Monitoring sends a constant stream of synthesized traffic to a website or application, ensuring the availability and reliable performance benchmarks of the respective application or web site. Synthetic monitoring offers enhanced end user experience by proactively detecting application performance issues, helping to quantify the business of commercial clients. It is a more active process than Real User Monitoring (RUM) and focuses majorly on the availability and reliability of applications. Synthetic monitoring service providers offer this enhanced real-time monitoring-as-a-service to their commercial clients for managing web and associated application performance. The scope of this report covers the synthetic monitoring market by component, service, deployment type, organization size, vertical, and region. The business consulting services segment is expected to dominate the market, at the highest CAGR during the forecast period as it deals with the transformation of ideas into solutions and infrastructure by providing advanced monitoring and management solutions to applications. Most of the synthetic monitoring and management service providers offer business consulting services to identify the risks and vulnerabilities in the current system infrastructure, monitor the entire system performance, and help in effectively troubleshooting them. The Software as a Service (SaaS) application monitoring type of synthetic monitoring market is estimated to grow at the highest rate during the forecast period as it actively monitors and troubleshoots end user experience for both web and SaaS applications, supporting both on-premises and cloud SaaS deployment. Furthermore, it also measure, monitors, and manages the performance, availability, and usage of all SaaS applications deployed across the enterprise or commercial customer site. North America is expected to account for the largest market share in the market, followed by Europe in 2016. Due to the critical need for pro-active monitoring of increasing complex applications and rising adoption of cloud-based SaaS application and DevOps application is increasing the adoption of synthetic application monitoring. The synthetic monitoring market is growing rapidly and is used for monitoring static backend systems into next-generation solutions to check dynamic customer application and to improve the performance and availability of the application. These next-generation monitoring solutions are deriving meaningful intelligence directly from the application that they monitor, which businesses can turn into actionable results that better serve customers, and improve business performance and operations. However, the lack of end user awareness in managing complex applications and using the traditional approach of monitoring and managing applications to gain visibility and performance benchmark is restraining the market.